Chris Wideman was poised for a breakout season before everything suddenly went wrong. After tallying eight points in his first 16 games this season, the Ottawa Senators defenceman suffered a devastating hamstring injury when Evgeni Malkin fell on top of him in November. Wideman has been sidelined ever since, and while he hopes to be back before the end of the year, Ottawa’s season is quickly winding down. The injury was a tough break for a few reasons. Not only was the 28-year-old playing some of the best hockey of his young career, but with him up for a new contract this summer, it looked like a pay raise was on the horizon. This injury has made matters significantly more complicated for Wideman, as there might not be room for him on the team next year. It’s taken Wideman a while to prove his worth to the Senators. The St. Louis native spent three years in the AHL after a successful NCAA career with Miami University. In his third year with the B-Sens, Wideman broke out offensively with 61 points in 75 games. This helped win him the Eddie Shore Award for best defenceman in the AHL. After making the jump to the NHL in 2015, Wideman showed some serious offensive upside but was not consistently given a spot in the Senators’ lineup. Wideman became more of a regular the following season, suiting up for 76 games. The Senators gave Wideman a heavier workload for the first few games this season while Erik Karlsson was recovering from offseason surgery. He did a fine job filling in for Karlsson on the team’s first power play unit, tallying two points on a team that struggled with special teams. After the Sens captain returned, Wideman still managed to contribute on the team’s second unit. At the time, the Senators were in dire need of some offensive production from their blueline. Thomas Chabot was still in the AHL, but Wideman, Dion Phaneuf and Cody Ceci all managed to contribute offensively. Is Wideman the Odd Man Out? Not long after Wideman’s injury, the Senators’ season went into a tailspin. Things have changed significantly since the fall, with Ceci not consistently producing and Phaneuf being traded to Los Angeles. While Wideman has proven to be a valuable player, Ottawa’s surplus of defenceman might keep him from returning next season. 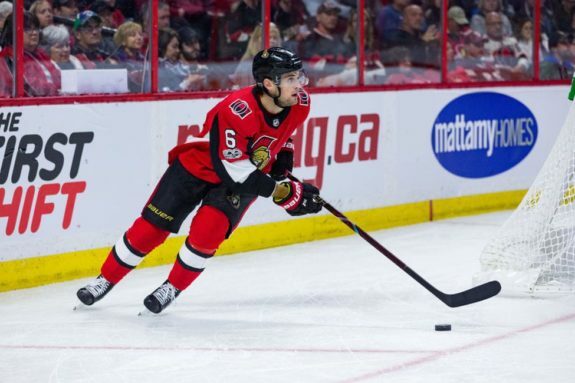 The Senators have seen a number of new defencemen enter the lineup since his injury. Thomas Chabot has proven he belongs in the big leagues and has been given a significant role on the Sens’ blueline. 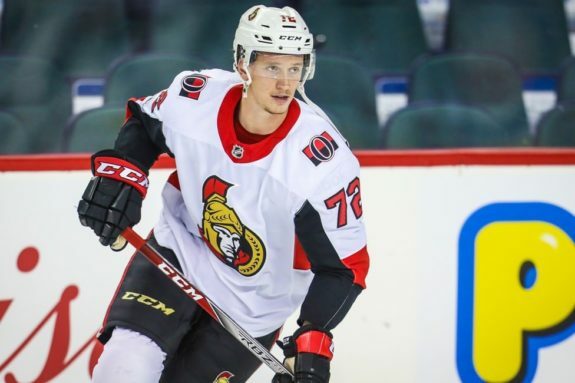 Chabot benefited from injuries to Wideman and Mark Borowiecki but had to bounce around between Ottawa and Belleville before finally becoming an NHL regular in late January. While both Chabot and Wideman are puck-moving defencemen, there is room for both of them on the Senators’ roster. However, Christian Wolanin has played well since his debut last week and could compete for a roster spot next year. Ottawa also has a few defensive prospects, like Andreas Englund and Christian Jaros, who could be NHL ready by next season. With Wideman, Ceci and Fredrik Claesson all in need of new contracts next year, Sens GM Pierre Dorion might have to let go of someone. Claesson has struggled to stay in the lineup this season following a strong finish to the year in 2017, and while Ceci has been given big minutes, he is not putting up the numbers of a top pairing d-man. Both Ceci and Wideman are right-shooting defencemen, and the two both put up 17 points last year. Both defencemen have offensive upside, but Ceci has been forced into a shutdown role which has only hurt his game. Given Wideman’s lack of size and occasional defensive zone struggles, the team has been less inclined to give him a defensive role. This is made clear by the fact that he did not get any penalty killing minutes this year. While Wideman is viewed as a more one-dimensional player, he is able to drive possession and give the team a puck-moving option on the third pairing. At the low cost it will take to sign him, Wideman is definitely worth bringing back.